Description Harcourt Road office space to rent, with occupancy on flexible terms. 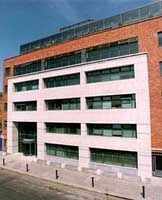 This high-quality office space is located in a modern, impressive building right in the heart of Dublin s business district, ideally situated between Camden and Harcourt Street. We offer five floors of fully serviced & flexible office space comprising reception services, telephone answering & mailbox, meeting-and conference rooms including video conferencing facilities - all serviced by our highly trained multilingual staff. With 45 years of experience on the market you are in safe hands. Besides secure parking possibilities, incl. bicycle park, we have available showers inside the centre. Harcourt Road offers accommodations to suit every budget, numerous restaurants and access to public gardens. Local, national and international access - Join us and work without boundaries.